ENID, Oklahoma – Since its founding in the early 1980s, Emmanuel Baptist Church has grown into a strong congregation that hosts three worship services on Sundays alone and activities that serve a broad range of adults, youth, students and other groups in the community. 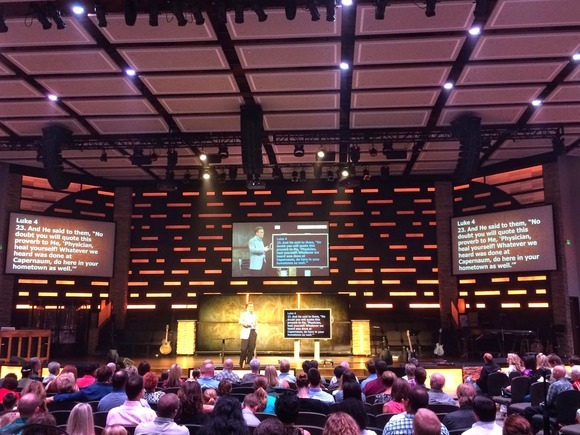 The church was overdue for an A/V/L system renovation and turned to Springfield, Missouri integrator, Paragon 360 for an upgraded audio system featuring HARMAN’s Crown, BSS Audio and JBL components to meet the needs of its contemporary worship environment. “This project was a full renovation with a major architectural redesign of the entire worship center. It involved new audio, acoustics, lighting, staging and video systems as well as new scenic elements custom designed for the church,” said Mark Coble, Audio/Acoustics Design and Commissioning specialist at Paragon 360. For this project, Coble and his design/build team needed to satisfy the requirements of three distinct groups: those attending traditional services with a choir; a more blended worship experience with praise singers and a band; and a modern, contemporary worship service. Paragon 360 deployed eight VERTEC VT4886 subcompact line array elements and a VT4883 dual-12-inch subcompact arrayable subwoofer in three main flown clusters each at the left, center and right of the auditorium. Two JBL STX828S subwoofers were placed in custom subwoofer enclosures located in the face of the stage and four AC28/26 compact 2-way loudspeakers serve as overhead monitors for the choir. Nine AC25 ultra-compact loudspeakers deliver under-balcony fill and four STX812M 12-inch stage monitors cover the pulpit/stage area. Seven Crown I-Tech 12000HD amplifiers power the main line arrays and subwoofers. Two Crown DCi Series 4|600 amplifiers drive the under-balcony and monitor loudspeakers, with a DCi 2|600 amp handling the choir monitors. The amps and speakers are networked using a BSS BLU-160 Soundweb London Signal Processor with BLU link in conjunction with a BLU-BOB break-out box output expander. In addition to the new audio system, Coble and his crew also did a significant amount of work adding the necessary acoustical treatments to optimize the sound of the sanctuary.